This week on Roll the List we look at cult table top RPG’s. This to me is a game that has a small group of people that will know what game you are talking I about and rave about it without any provocation. For me this game is Paranoia, an awesome game set in the future where you are all following the bidding of a crazy insane computer while trying to survive. 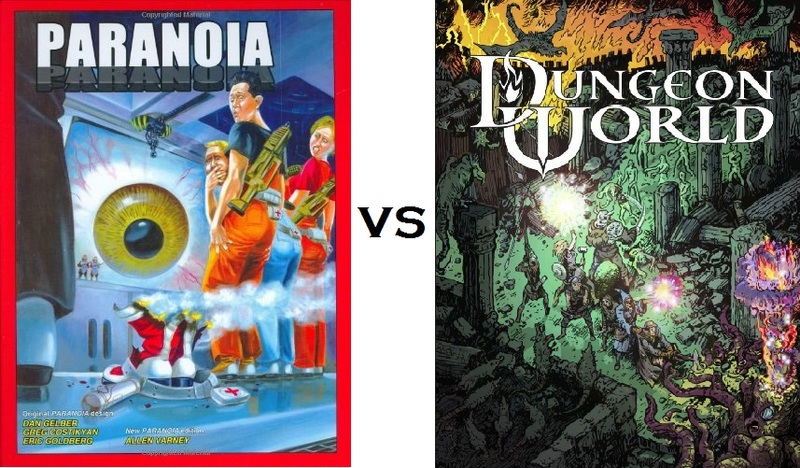 Cait’s choice is Dungeon Worlds and I will use this article to show why Paranoia is far more of a cult game than Dungeons Worlds. To me there are three big things that make Paranoid more of a cult RPG than Dungeon Worlds. The main one is that the setting. It is dystopian to the point of tongue-in-cheek cynicism. This to me is a hard contrast to the just-put-some-stuff-together-and-see-what-falls-out attitude of Dungeon World. It allows for the people that play Paranoia to have experiences that evolve it into a cult RPG. Playing in a cutthroat dystopian world where you are all trying to serve a computer while having secret goals to betray each other makes for an awesome experience. Also you don’t really die per say in this game. You do get killed in a myriad of horrible manufactured by your friends and the computer but you have a certain amount of clones that will be used to replace you should you die, and you will. Speaking of clones and human lives another large difference that makes Paranoia more of a Cult RPG is the character building system. Dungeon Worlds characters are built using a simple system of basic Dungeons and Dragons stats, moves and relationships. Which make the game very simple to play but doesn’t really remove it’s self from the traditional world of RPG. Paranoia throws the whole system for a loop as each player is choosing their own character while simultaneously building their opponents’ characters. After all the skills have been set, the stats are derived by your opponents’ into four separate stats. So by then end of the character building process you have already build a deep and intense hatred between the characters, which can make the stories just that much more interesting. The final thing that makes paranoia a cult RPG is how widely distributed it is. Not many people know about it as in general. People talk about Dungeons and Dragon and other fantasy RPG and they are more wide spread. I know it sounds very hipster but one of the most amazing things about Paranoia is telling someone about the game. I got to do with Cait. Anyone else I have told about this game just just floored by how strange and amazing it sounds. I was when my friend told me about it. Dungeon World was touted it self as an old school system that was very usable by any player base. They literally sold them self out of being a cult game. Unlike Paranoia, Dungeon World not having a particular setting and intriguing rule set associated with it means that it doesn’t have the ability to evoke such meaningful and utterly hilarious responses to its play. Also Paranoia protects its self from being to popular by being such a specific and strange RPG that not everyone will pick it up of the shelf and throw in into the RPG bookcase to use any time. If you would like to read Cait’s Take check it out here!